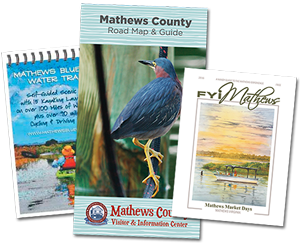 Mathews County has so much to offer with 214 miles of beautiful shoreline, vast outdoor recreational activities, exotic peninsulas, rich history and sunny beaches all along the Chesapeake Bay. It is home to a variety of restaurants and a vast selection of seafood served bay to table. It is the second smallest county in Virginia with a lively creative economy that offers busy farmers and merchant markets, art galleries, antique and artisan studios, aquaculture industry, and several museums that celebrate the maritime culture. Many of these destinations are available on the River to Bay Artisan Trail and Virginia Oyster Trail. 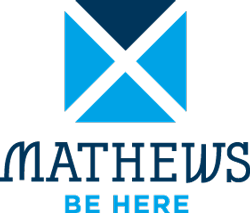 You need a few days to really experience the area, and now we are happy to announce that the county offers a brand new boutique hotel right in the heart of all the activity – downtown Mathews! 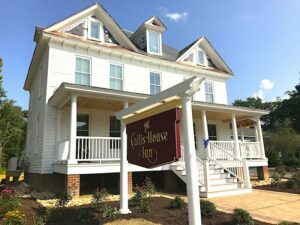 The Callis House Inn just opened in August of 2018 and has five Chesapeake Bay-themed rooms for people to enjoy. The Callis House dates back to 1908 and was built by local contractor Eddie Callis. It served as his family home while he ran a local store in town which was located where the Bay School Community Arts Center currently stands. In 2016 the nonprofit group, Preservation Mathews, acquired a loan to save the home from being torn down and moved to its new location on 345 Main Street with the help of Morse Construction. It was then lifted and renovated into a hotel and now serves as Mathews’ only hotel, and second lodging option along with the local bed and breakfast, the Inn at Tabbs Creek. The Victorian home has been renovated on the exterior, and modernized on the interior to hold 4 rooms, and 1 suite on the third level. Each rooms offers modern amenities including a flat screen TV, wi-fi, Keurig and mini fridge, in-suite bathrooms, and queen-sized beds. The Callis House Inn is right in town so people can walk down the road to the courthouse to explore, shop and eat from a variety of delicious restaurants. Guests can also launch their kayaks from from the brand new Put-In Creek Park just walking distance away! A café will also be opening right across the street in November, 2018 called Back In Time for visitors to start their day with coffee and pastries. 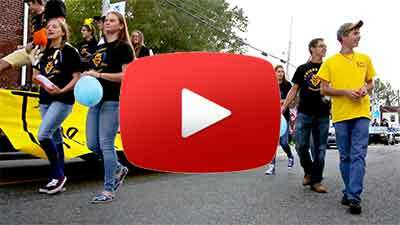 Every year thousands come to visit this secluded beach town to slow down and enjoy the Chesapeake Bay lifestyle. Now they can extend their stay at Callis House selecting their preferred room: “Birds of the Bay,” “Sea Life Room,” and “The Mermaid Suite,” for example, feature artwork, soaps and carpentry from the local area. Find out more and book your stay by visiting the Callis House Inn website.